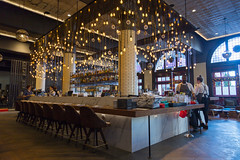 It’s actually a rather nice space: the three large garage bays from the old, well, apparatus room make for a nice open-concept restaurant, with a large bar in the front, an open kitchen in back, and a lot of open table and booth seating. They’ve done a nice job keeping a lot of the architectural details around, too, including the stamped tin ceiling, the old hose hang on the way to the restrooms, and a lot of nice brick work. We can for a Saturday breakfast, and the breakfast menu is a good selection of basic American breakfast: omelets, breakfast platters, breakfast sandwiches, and a few lighter selections like steel-cut oatmeal. Myself, I decided on doing their variation of a Full English: fried eggs (3 of them! ), roast tomatoes, English baked beans, mushrooms, bangers, rashers, black and white pudding, and toast. 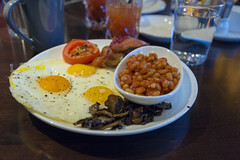 While a bit pricey at $15, I’ll have to say that this was a bountiful breakfast, and a well-done one at that: the eggs were a perfect sunny-side up, the mushrooms tasty but still firm and not rubbery, the bacon a perfect crisp, and the various bits of sausage and pudding quite tasty. I’d happily get this again. 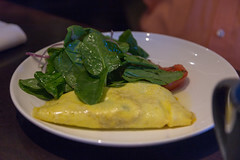 My two dining mates opted for the “Breakfast a la Francoise”, which was an omelet with leeks, comte cheese, forest mushrooms, and a light salad, and I found this to be an enjoyable omelet, although to be honest, I think I rather enjoyed the Full English more. 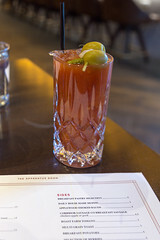 Rounding it out with a pleasantly spicy (and very, very tangy) bloody Mary, and I’ll call this a successful breakfast. 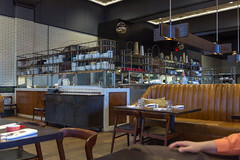 I’d love to return to the Apparatus Room sometime for dinner or cocktails. (Closed) here are several cuisines that are difficult for me to enjoy in rural NH, two of the most notable being Middle Eastern food and Vietnamese food. So whenever I’m travelling, I try to find good places to fill these gaps. Luckily, my September work travel ended up taking me to the western Detroit metro area, which is loaded with good Middle Eastern places. One of the more notable chains is La Shish (which I’ve been to before, although in a different location), which happened to have a location just down 6 Mile Road from my hotel.